Kon Tum doesn’t have much of a food scene but it does have some small eateries serving up local fare that will satisfy. Breakfast in Vietnam means noodle soup, and noodle soup shops with the usual small stools and long tables are plentiful, but get in early – shops can sell out by 08:00. A local brought us to Quan 54 at 93 Phan Chu Trinh and the pho bo did not disappoint. A delicious bowl of beef noodle soup is only 30,000 dong. For lunch and dinner in Kon Tum, it’s usually rice with meat and veg. 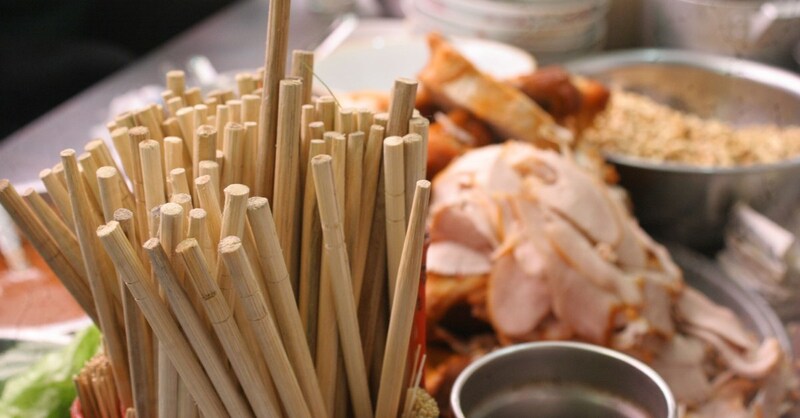 One place to try is popular Hiep Thanh, which serves tasty com ga or chicken rice – get a plate heaped with rice cooked in a flavourful broth with a crispy fried chicken leg for 55,000 dong. If you’re part of a group, there are also a few meat and vegetable dishes ideal for sharing starting at 70,000 dong and seafood hot pot for 200,000 dong. It’s a nice, clean and relaxed sit-down atmosphere. Com Tam 213 serves one thing: com tam, cooked broken rice grains topped with barbecue lemongrass pork. A plate, served with a small bowl of soup and some pickled veg, is only 25,000 dong. Add a fried egg on top for an extra 5,000. You’ll see their sizzling barbecue grill out front at the corner of Phan Dinh Phung and Tran Hun Dao Streets. Head to Ba Ky at 649 Nguyen Hue Street for bun thit nuong, a bowl of cold rice vermicelli with a peanuty sweet-spicy dressing topped with grilled pork and fresh herbs, for 20,000 dong. To be honest, this dish was just okay and it paled in comparison to ones we’ve had elsewhere in Vietnam – to be fair bun thit nuong is a southern Vietnam specialty – but it does break up the monotony of rice and meat for supper. Nem nuong is also on the menu. Try these do-it-yourself wraps of rice paper, lettuce, grilled pork, herbs and dipping sauce. Another dish in the “something different” category is bo ne, a sizzling hot plate with seared beef and a fried egg – think of it as a Vietnamese steak and egg. Scoop everything up with warm baguette. Try it at 211 Le Hong Phong Street. The streets surrounding the Vinatex shopping market have evening street eats that include banh mi sandwiches, steamed buns and very aromatic (i.e. stinky) grilled dried squid. The traditional rice dish bun kho is available throughout town, but we found the best place to experience it was to venture into the crowded central market and sit down at one of the stalls. You’ll find colourfully arranged plates of different kinds of glutinous rice pasta, covered with chopped spring onions. When you pick a plate, a sweet pork broth is poured over it, along with anything you choose to add on top, such as cha nam (deep fried spring rolls), cha lua (pressed pork in a banana leaf) and banh cuon (a kind of rice-flour roll). It’s a much tastier and satisfying meal than you might imagine from the description, and it’s dirt cheap. Finding a spot means taking a seat on a terrace draped in a cascade of vines and antique gongs, or upstairs perched like a bird on a balcony. Tables are made of tree trunks and wood branches have been fashioned into chairs. Chill out with a reasonably priced fruit shake, smoothie, coffee or tea. Explore the sculptures and art installations that dot the garden. Since most local beer bars are predominantly for men, this is a great place for both men and women to come for an evening beer. Unfortunately there’s no food or snack menu, just some items available for breakfast. Kon Tum isn’t much for nightlife, but a great way to end the day is riverside at any one of the many footpath joints. Plant yourself on a lawn chair and enjoy a beer as the sun goes down. The experience puts a positive spin on an otherwise underused riverfront. For something more formal than a lawn chair, try Indochine Cafe, a covered outdoor terrace part of Indochine Hotel. There’s the usual coffee, fruit juice and tea. Though it’s found across the street from the banks, you can still get a glimpse of the water. The regional speciality of the Central Highlands is wild game. The region was once rich with wildlife that has now all been but wiped out. Though it is illegal to trade and serve endangered species, it still often winds up on restaurant menus due to local demand. If you’re one of those gourmands who likes to try everything, it may seem tempting but you’d be participating and worsening a very serious problem. Now you know. Ba Ky: 649 Nguyen Hue. Bon Ne: 211 Le Hong Phong. Com Tam 213: 213 Tran Hung Dao St, at corner of Phan Dinh Phung and Trang Hung Dao St.
Eva Cafe: 05 Phan Chu Trinh St; T: (060) 3862 944; evacoffee@ymail.com; open daily 06:00-22:30. Hiep Thanh: 621 Nguyen Hue St; T: (060) 3862 470. Indochine Cafe: 30 Bach Dang St; T: (060) 3863 335. Pho 54: 93 Phan Chu Trinh St; T: (060) 3863 304. Where are you planning on heading to after Kon Tum? Here are some spots commonly visited from here, or click here to see a full destination list for Vietnam.